Heading out for Chinese food every weekend is almost a tradition in itself in today's society. Half the merchandise we import is from China and recently the younger generation is also taking an avid interest in Chinese movies, the subtitled ones of course. Yet while Thailand, Malaysia and Singapore remain favourite destinations, somehow China is rarely mentioned as a popular tourist destination, often just visited for business purposes. 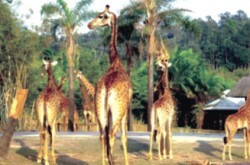 Though not widely publicised, Guangzhou can be described as one of the top tourist spots in China. Being a sea-port, it's a busy bustling city and holds a variety of attractions, whilst also giving you a feel of being in a completely different culture as you encounter very few tourists and interact with mostly locals. A shopping area in Guangzhou. In Guangzhou there's something for everyone. Regardless of whether its relaxation, shopping or thrills you seek, there's a sure fire guarantee that you'll find it here. Nature buffs can make a visit to the famous Baiyun Mountain (or 'White Cloud Mountain' as translated). The mountain, with its abundance of scenery and waterways is a heavenly retreat far away from the hustle and bustle of everyday city life. The mountain peak can be reached in two ways travellers can either choose to climb up the mountain or alternatively travel to the peak via one of the numerous cable cars which have been constructed for this facility. The latter is a highly recommended option as it saves you time and energy, and the scenery which will greet you on your ride is indescribable. Imagine floating within clouds, breathing in clean unpolluted air with each breath and looking down at the entire city to find that the largest buildings look like tiny grains of rice that's the experience awaiting you on Baiyun Mountain. To make your experience even more memorable travel up to the mountain via cable car in the late afternoon, enjoy the sunset on the mountain, and travel back to the city in the same way, whilst the blinking evening lights greet you warmly. Thrill-seekers should head to Chimelong Resort. This is the only Resort in China, and most possibly in the whole world, which boasts a variety of attractions. Ride the adrenaline pumping roller coaster with its twists and turns and other fun filled rides at Chimelong Paradise, watch the mesmerising Chimelong Circus show with acrobats and trained animals performing fun and seemingly impossible feats, enjoy beating the heat of a fiery summer days whilst indulging to your heart's content in the Chimelong Water Park, interact with wild animals on a personal basis whilst observing them in their natural wilderness habitat in the Chimelong Safari the possibilities are endless. It's ideal for a family vacation, a couples retreat, or even a much awaited holiday with friends where you can make priceless memories. The Circus show also consists of a 'walkway performance' where the performers move directly into the crowd and do a two or three impromptu shows, and you will have the opportunity to take pictures whilst cuddling tiger cubs at the Safari. You might consider spending a couple of nights at the resort itself, the advantage being that you would get complimentary entry to all these attractions. Alternatively, if you prefer the buzz of city life, you can also take the metro to Chimelong Resort and then make use of the free shuttle service to transport you to the various attractions. Speaking of city life, Guangzhou city has in itself quite a few different places ideal for those who would like to get a taste of local culture. There are quite a few parks, museums and temples for the adventurous traveller. The Orchid Garden Park is a specifically good recommendation for those who would like to get a rough idea of how local people would spend an ideal afternoon. Instead of having differed clusters of orchids all bunched together in one area, this park actually utilizes the theme of spreading the orchids out amongst its paths and walkways, so that visitors can truly delight in finding them during their explorations. You can also find several bonsai trees as you explore, alongside tiny bridges and even hop over stepping stones to cross a stream. Once the exploration is over, you can choose to have traditional Chinese Tea at any of their teahouses, or choose the one which is owned by the Park itself. 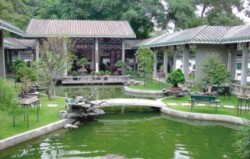 The benefit is that the tea price is already included in the admission ticket and the teahouse boasts perfect serene surroundings, with a balcony overlooking a pond teeming with goldfish and surrounded by foliage. Also, if culture is more your thing, Guangzhou boasts a number of museums and temples. If time is a constraint and it's impossible to visit them all, the Temple of Six Banyan Trees is particularly recommended. The architecture is amazing and it skilfully comprises the different aspects of Chinese culture. Also, if you time your trip to coincide with any of the many Chinese festivals, you can also enjoy soaking up the culture whilst partaking in the Festival celebrations. We were lucky enough to have our trip coincide with the Dragon Boat Festival, and the celebratory environment was infectious. Imagine being in the centre of the world's retail market and being able to take advantage of all the fantastic branded clothes, shoes, bags, watches, jewellery, etc. buying them at a fraction of their cost. Guangzhou turns that fantasy into reality. Shopping is more than a fancy lazy aimless pastime here, in Guangzhou shopping actually becomes a full-blown purposeful activity. 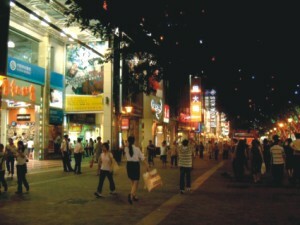 Popular shopping destinations include Beijing Lu and Shangxiajiu Lu as the popular shopping districts, as well as Grandview Shopping Mall and Tee Mall. Keep your eyes peeled for unexpected delights- we were lucky to witness an impromptu ice-skating show in Grandview Mall. The area surrounding Guangzhou East Railway Station is also a treasure trove for enthusiastic shoppers. However, it's generally a good idea to not limit yourself to just checking out the well-advertised shopping outlets, often impromptu trips into tiny shops off the beaten path can yield hidden treasures. One can browse for hours at their leisure and still never get bored, it's actually possible to get all your fashion needs from Guangzhou (in terms of shoes, bags, jewellery, etc.) for an entire year. It's a smart move to pack lightly whilst going to Guangzhou, leaving some luggage 80 percent empty if needed trust me, you'll be thankful for the empty space on the return trip. The shopping experience isn't just limited to clothes and accessories; almost everything else in China is cheap too. We purchased custom made curtains for our house from Guangzhou for a fraction of what it would have cost us in Dhaka. There is also a wide choice of ivory and antiques, alongside many household items and knick knacks which will delight you. Authentic Chinese calligraphy is also a popular choice amongst tourists to purchase for their homes. It's almost impossible to describe every single attraction Guangzhou has to offer, but it's worth mentioning that one would require adequate time to unravel the mysteries of this enchanting city. It's not something that could be covered in the span of a weekend, a fortnight would be a better choice. Additionally, although the locals are friendly and helpful, since the language barrier may be a problem, it's advisable to perhaps hire an English-speaking guide. As a last note, even though Guanzhou has all the western food chains (McDonalds, Subway, Starbucks, etc), it's worth venturing out for their local cuisines. With an English speaking guide this shouldn't be an impossible task, just remember to mention to him which items you want to steer clear off, and he'll take care of the rest. We enjoyed local delights like stone crab vermicelli and fried ice cream (sounds impossible, but extremely delicious) amongst many others. Bon Voyage !